Kangaroo Leather Soccer Cleats, or Conventional Leather Cleats? Our Guide to Choosing What’s Right for You. When searching for soccer cleats, you’ll find a myriad of different materials to choose from, but it’s hard to beat the durability, quality and comfort of leather. It’s the material of choice for professional players, and its ability to stand up to dirt, mud, tackles and other field hazards means that you won’t be buying a new pair of shoes each season. But buying leather soccer cleats isn’t as simple as you might think. There are two different types of leather available: kangaroo and conventional (cow and calfskin). Which one is right for you? What’s the difference between each type? Kangaroo leather: The preferred choice of professional players, kangaroo leather is incredibly soft and light, and conforms to the foot for extra comfort. Unlike traditional cow leather, kangaroo leather requires virtually no break-in time. The only issue with kangaroo is that it’s not weatherproof and isn’t as durable as cow leather. Cow leather: Derived from mature cattle, cow leather is tougher and thicker than kangaroo leather. Because of its high durability, this type of leather can withstand some serious wear and tear. Cow leather is water-resistant and comfortable to wear. However, it does require a fair amount of break-in time. Calfskin leather: Calfskin offers more durability than kangaroo, and is just as soft. Water-resistant and able to maintain its shape, the only drawback to this type of leather is that it needs to be broken in. What type of leather is right for you? Let’s take a look at the top 5 leather cleats to help you find one that fits your needs. While there are a number of different leather soccer cleats on the market today, these five have proven to be the best in terms of customer satisfaction, durability and price. Nike Tiempo Genio – Featuring full-grain cow leather, the Nike Tiempo Genio is durable, comfortable and delivers serious ball control. With an EVA insole, these shoes boost responsive cushioning on impact. The TPU plate features bladed and conical studs that offer superior grip out on the field, so you can make lightning-fast cuts and quick breaks. These Nike leather soccer cleats are available in three colors: black/white; white/green; and green/black. The superior traction and responsiveness of this shoe makes it a great choice for midfielders and forwards. And the durable leather upper will ensure that your cleats last you several seasons. 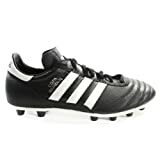 Adidas Copa Mundial – When it comes to Adidas leather soccer cleats, the Copa Mundial is the clear choice. Featuring a kangaroo leather upper, these shoes have been a standard in the sport for over two decades. Although a little more costly than other leather cleats, the Copa Mundial is built to last and offers unbeatable comfort. The dual-density outsole and EVA insole enhance comfort even further, eliminating stud pressure and pain. A durable, direct-injected outsole provides maximum traction out on the field, while the leather upper allows for superior ball control and kick velocity. If you’re serious about soccer, the Copa Mundial is your go-to cleat. Diadora Forza MD – From the Italian Diadora brand, the Forza MD is an affordable cleat made of polyurethane synthetic leather. While not genuine leather, the Forza is an excellent choice for players who are on a tighter budget. Plus, the synthetic leather used in this shoe looks, feels and acts just like real leather. It’s durable, soft, and comfortable. The cotton insole features EVA foam that’s shock-absorbing, which minimizes stud pressure and pain when playing on firm ground. With a rubber MD outsole, these cleats offer excellent traction and responsiveness for quick cuts and incredible acceleration. If you’re on a tighter budget, but don’t want to sacrifice quality, the Forza MD from Diadora is a great option. The Nike Premier Soccer Cleat – The Premier Soccer Cleat is Nike’s answer to the Copa Mundial from Adidas, but with upgraded materials, it’s a step ahead of the Adidas classic. Featuring rich kangaroo leather, this shoe has a simple design and excels in the performance department. The heel and quarter panels feature goat leather, which greatly enhances the comfort and feel of these cleats. With an anatomical sockliner, these boots offer low-profile cushioning and extra support for comfort that lasts the entire game. The softness of the kangaroo and goat leather provide great ball feel and allow for superior control when you’re out on the field. The Premier Soccer Cleat is one of the most comfortable soccer boots you can buy – some compare its comfort and performance to Puma Kings and the Adidas Tiempo – but it’s available at a fraction of the cost. For players who are budget-conscious, but still want top-quality cleats, this is the right shoe for you. Adidas Gloro FG Cleat – The Adidas Gloro is, more or less, the upgraded version of the Copa Mundial, and a shoe that players have been waiting quite some time for. Designed with premium K-leather, these cleats offer the softness and stability that players crave. While the majority of the upper is made from K-leather, the heel features synthetic leather for added durability. The inner lining keeps the foot locked down while maximizing comfort. The EVA insole offers extra support and shock-absorption without weighing you down. Designed for firm ground, these boots provide full-game comfort and superior traction, so you can play at your best every time you step out on the field. The type of leather: The first and most important thing to consider is the type of leather. Will you choose cow, calfskin, or kangaroo leather? Kangaroo is preferred because it offers superior ball feel and is lighter than full-grain leather. With that said, kangaroo is not water-resistant and has a tendency to wear easily. Cow leather is the most durable, but not as soft or natural-feeling. Calfskin is soft and more durable than kangaroo, offering you the best of both worlds. The size: Size is always important when choosing a cleat. The shoe should fit snug, as leather will stretch after a few uses. Be sure to check sizing recommendations if you’re buying online to avoid having to exchange the shoes for a larger or smaller pair. The price: Price is another important consideration. Leather cleats will cost more than cleats made with synthetic material, but will offer better performance and durability. Aim to buy the best quality you can afford. The stud configuration: The type of ground you play on will also play a role in the type of leather shoe you buy. If you’re playing on firm ground that’s not too muddy or wet, opt for an FG shoe. If you’re playing indoors or on soft ground, buy the appropriate shoes. It can be more difficult to find soft ground shoes built with genuine leather, but if you do find a pair, you’ll need to be diligent about care to keep your shoes in good shape. When it comes to leather cleats, the five shoe models above are the best available, but the right one for you will depend on your budget and your needs. This entry was posted on January 24, 2016 by admin.